The Canadian and American Manchester Terrier Club Health Committees would like to thank all of the breeders from around the world who contributed to this project through completion of the Manchester Terrier/English Toy Terrier Breeder’s Health Survey. 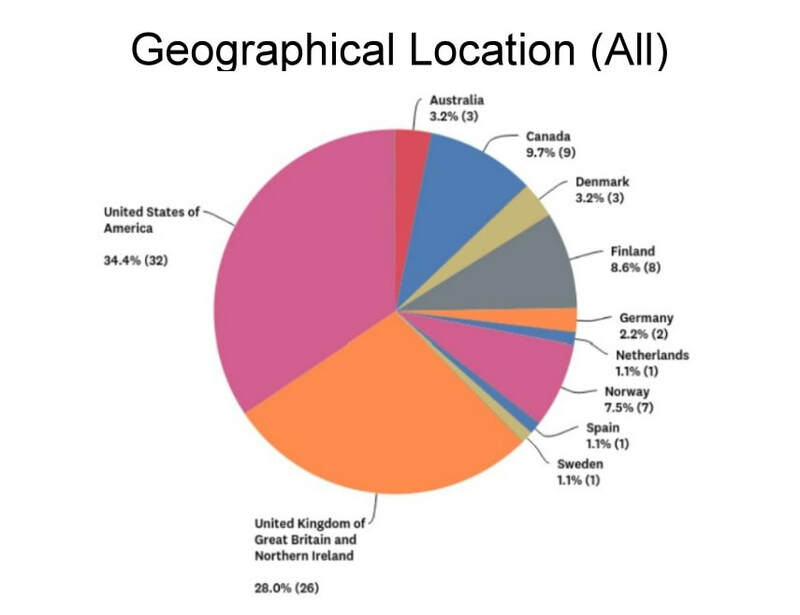 We are sure you will agree that the survey reveals interesting and important information about our global community as well as each breed/variety sub-population. During the summer of 2017, the Canadian and American Manchester Terrier Clubs administered a comprehensive online survey of Manchester Terrier, Toy Manchester Terrier and English Toy Terrier breeder. 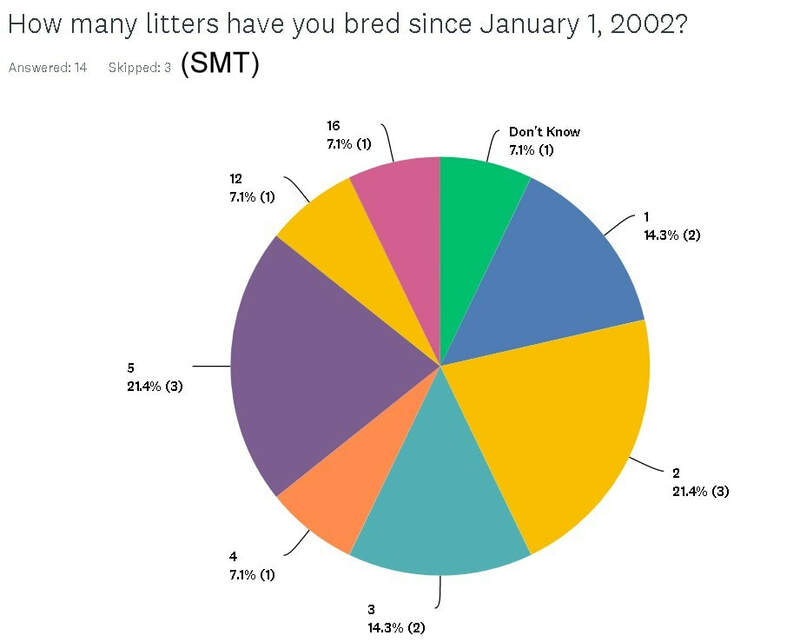 The survey aimed to collect information on breeder demographics and interests as well as insights into aspects of breed health on a global scale, including litter sizes and health testing practices. 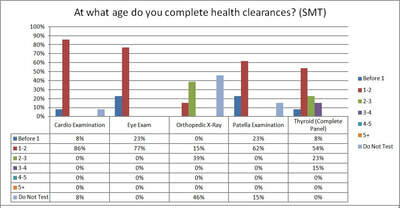 The Breeder’s Survey was delivered electronically via a web-based interface hosted by SurveyMonkey.com. Questions were based on a portion of the successful 2002 North American Manchester Terrier health survey conducted by the Canadian and American Manchester Terrier Clubs. 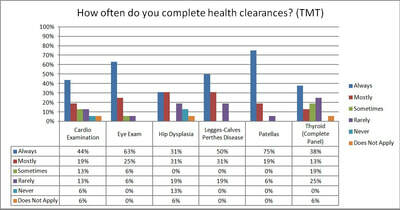 A total of 97 surveys were started, with 59 respondents (60.8%) answering all survey questions. 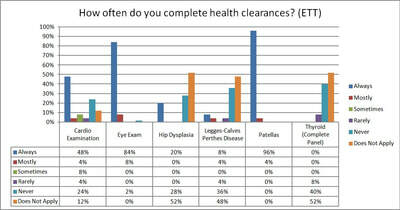 Of the 38 individuals who did not complete the entire survey, 23 (23.7%) ended participation after providing demographic information only. 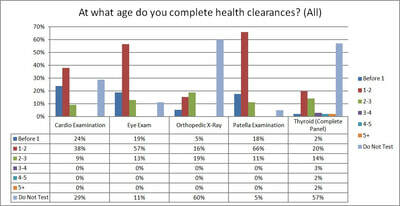 To assist in contextualizing results, an approximate number of responses received for questions in each section of the survey have been included in the analysis. Responses for each question may vary. Comparative information for Toy and Standard Manchester Terrier results has been drawn from the 2002 General Health Survey, however it must be noted that the number of responses received in 2002 was significantly higher than in 2017. 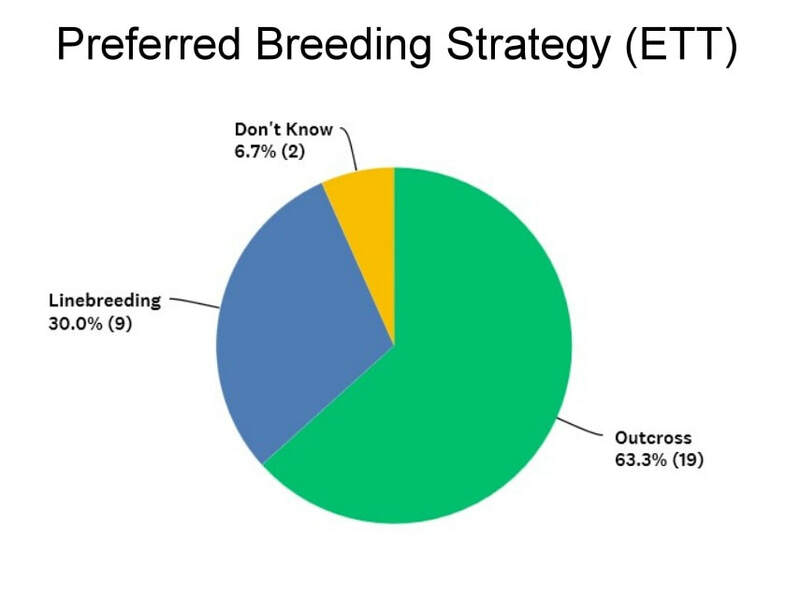 In 2002, 70% of the 86 respondents to the survey identified themselves as breeders for a total of approximately 60 breeder responses. In 2017, Toy and Standard Manchester Terrier results numbered 43, with many questions reflecting fewer responses. When considering comparisons, please also keep in mind that the 2002 survey did not differentiate between Toy Manchester and Standard Manchester results. For clarity, when comparisons are made in this document between the two surveys, 2017 statistics referenced reflect combined Toy and Standard Manchester breeder responses in order to facilitate comparison of like data. 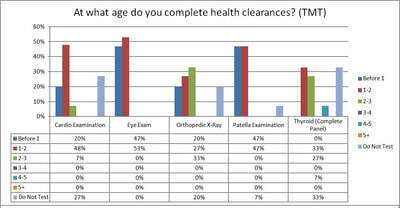 Questions in the demographics section were answered by 92-97 respondents. 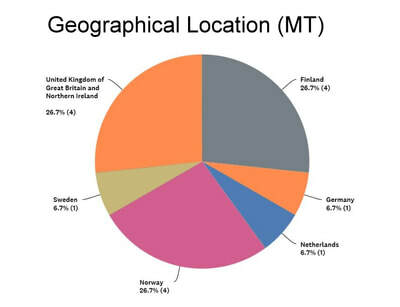 26 Toy and 17 Standard Manchester Terrier surveys were completed by breeders in North America. 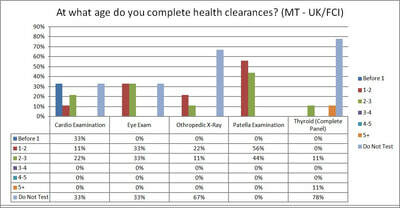 While Toy Manchester results appear more significant, it should be considered that seven respondents provided only basic demographic information and an additional three answered less than half of the survey, meaning most questions reflect responses from 16-19 or fewer TMT breeders while 14 SMT breeders provided complete or almost complete surveys. 15 Manchester Terrier (UK/FCI) breeders started the survey and provided demographic information, however only 10 fully complete surveys were received. 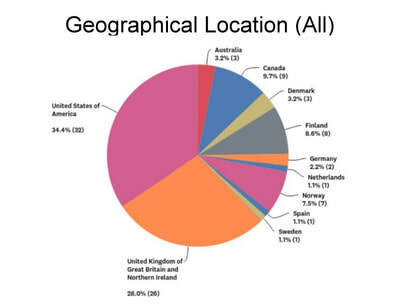 Of the complete or near complete surveys, the majority of the breeders (7) were from Norway and Finland followed by one each from the United Kingdom, Germany and the Netherlands. The remainder of respondents tended to abandon their surveys after providing demographic information (i.e., gender, location, etc.) only. 39 English Toy Terrier breeders began the survey, with just 8 respondents discontinuing after providing demographic information and 26 providing nearly complete responses. 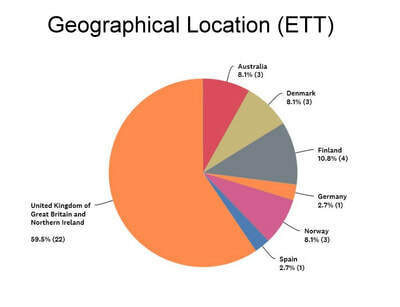 22 ETT breeders are from the United Kingdom, with 15 more hailing collectively from Australia, Denmark, Finland, Germany, Norway and Spain. While 15% of respondents worldwide are male, it is interesting to note that 100% of Toy and Standard Manchester Terrier breeders who responded to the survey are women. Meanwhile, 28% (10 of 36) of English Toy Terrier breeders identified as male as did 27% (4 of 15) Manchester Terriers (UK/FCI) breeders. Distribution of ages across the global population generally demonstrates small numbers of breeders under the age of 40 and at least half or more over the age of 50. A trend toward older breeders is particularly apparent among English Toy Terrier breeders where 73% of breeders are over 50 and among Toy Manchester Terrier breeders where 60% of breeders are over 50 (including 36% over the age of 60--the highest proportion among the four breeds/varieties). On the other end of the spectrum, Manchester Terrier breeders outside North America have the largest proportion of younger breeders with 40% of breeders less than 30 years old. When asked about activities they take part in, 92% of the 93 breeders who responded worldwide reported involvement with Conformation, followed by 30% involved in Obedience/Rally and 24% with Agility. Lure Coursing (21.5%), Earthdog/Barn Hunt (19%), and Tracking (11%) were also mentioned as significant activities among breeders. 17% of respondents consider themselves active in Manchester Terrier Rescue. Of note, Standard Manchester Terrier and Manchester Terrier (UK/FCI) breeders show a markedly higher tendency to be involved in more of the physically active activities on the list, with approximately 75% of breeders in both groups selecting at least one activity aside from conformation and rescue. By comparison, 50% of Toy Manchester breeders and just 30% of English Toy Terrier breeders indicated they are active in a performance-related activity. 82% of breeders are members of their national breed club, with 3% indicating that their country does not have a national breed club. 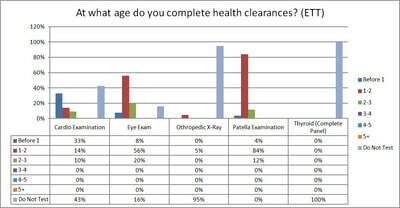 Questions in the breeding practices section were answered by 70-73 respondents. 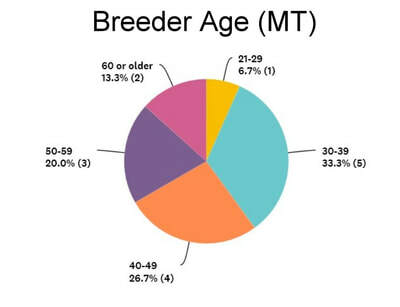 Globally, the majority (28.8%) of breeders have been breeding and/or involved with the breed for 10-15 years, with similar proportions indicating involvement for 5-10 years (26%) and 15-25 years (24.7%). 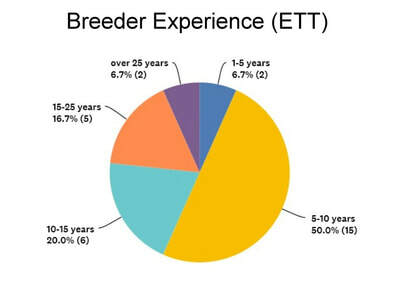 Ten breeders, representing 13.7% of the worldwide sample, indicated they have been breeding or involved with the breed for over 25 years while on the opposite end of the spectrum just five (6.8%) have been involved for 1-5 years. Looking at each sub-population, English Toy Terrier breeders claimed the largest proportion of newer breeders with almost 57% having been breeding or involved in their breed for less than 5 years. By comparison, only approximately 10% of Toy Manchester and Manchester Terrier (UK/FCI) breeders and 0% of Standard Manchester Terrier breeders have been breeding less than 5 years. In fact, Toy Manchester Terrier breeders demonstrated the exact opposite results with 58% of breeders indicating involvement for more than 15 years. In Standard Manchester Terriers, not a single breeder claimed less than 10 years experience and fully 64% of respondents fall into the 10-15 year category. And, finally, 50% of Manchester Terrier breeders outside North America have more than 15 years experience, which is particularly interesting when it is considered that 40% of those breeders indicated they are less than 39 years old. 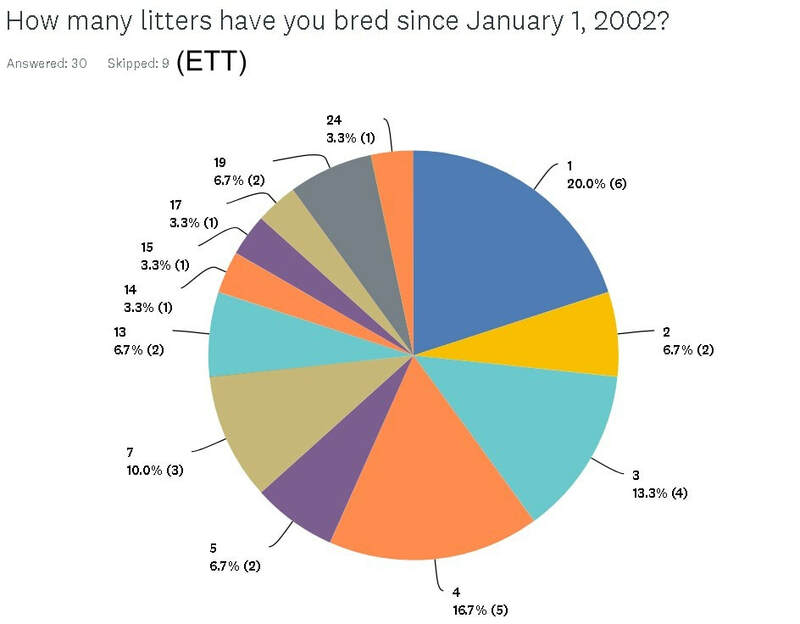 Across the survey’s 15 year time span (2002-2017), breeders across all breeds or varieties produced an average 8.7 litters each, reflecting a range from breeders who bred just one litter during that period (19%) to breeders who bred more than 25 (5.5%). 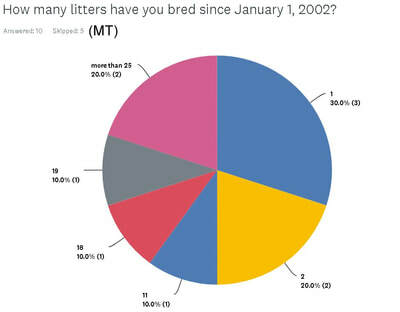 In this case, however, the median number of litters produced may be more important than the average as the small number of breeders who have bred regularly across that time period tend to skew the data to a higher average than can be considered representative. 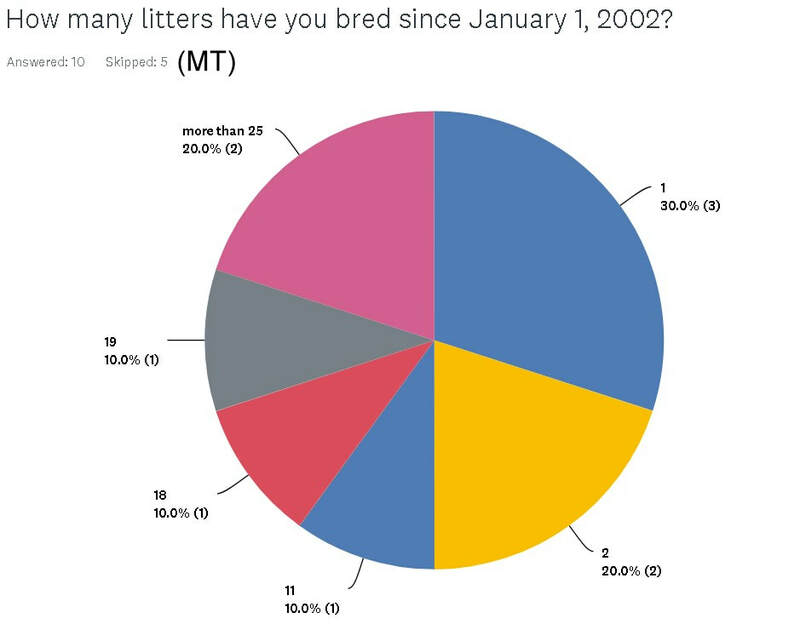 With that adjustment in mind, the median number of litters produced during the last 15 years was just 5 across the 73 breeders who responded to the question. 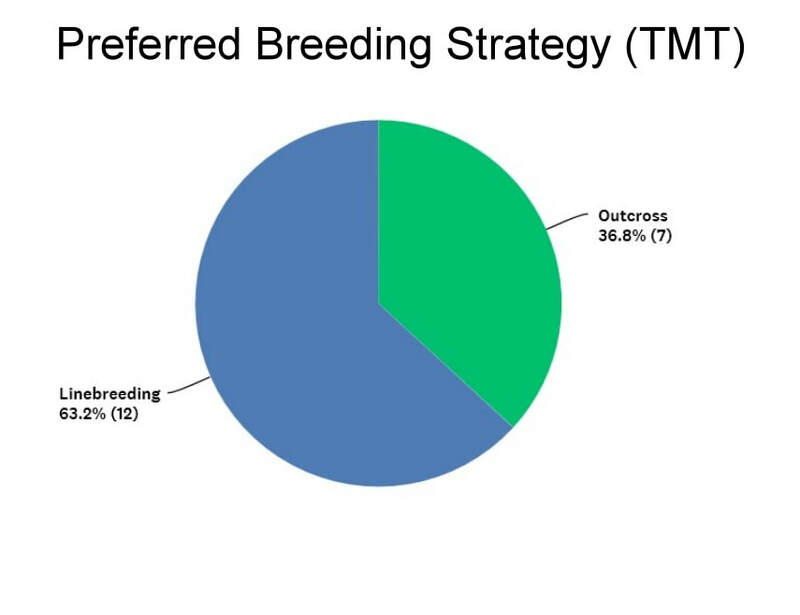 Keeping in mind that 67% of breeders globally indicated they have been breeding or involved in the breed for more than 10 years, it is noteworthy that 66% of breeders reported producing ten (10) or fewer litters in the last 15 years. Looking at each individual population, from 2002-2017 Standard Manchester Terrier breeders reported an average of 4 litters each, English Toy Terrier reported some 5 litters each, Manchester Terrier (UK/FCI) breeders produced an average of 7.5 litters each and Toy Manchester Terrier breeders produced approximately 9 litters each across the previous 15 year period. 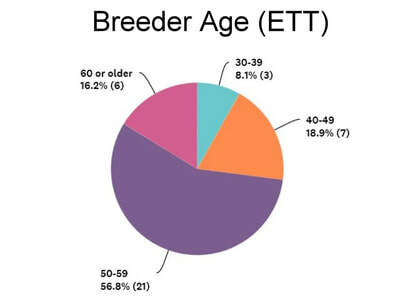 To be fully understood, these numbers must be viewed with an eye toward the length of time breeders in each variety have been breeding. 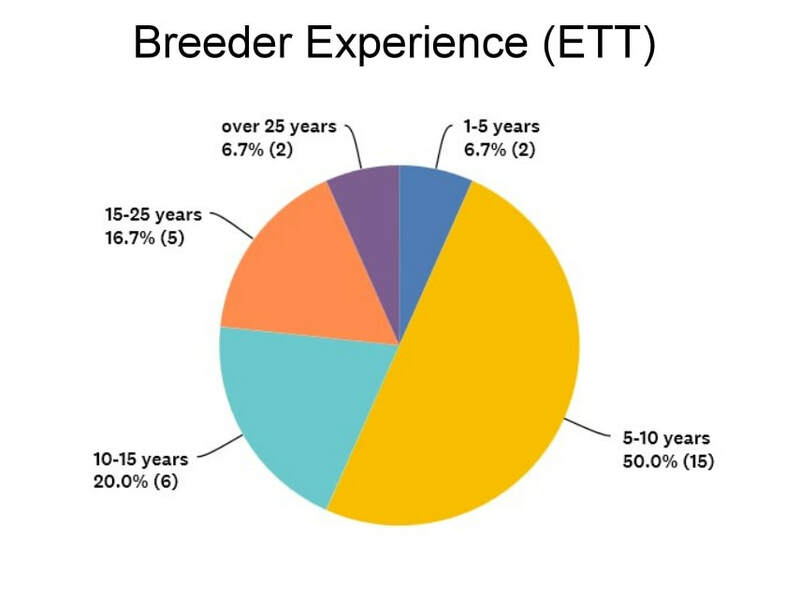 Per the demographics section above, for example, 58% of Toy Manchester breeders indicated they had been involved with/breeding for more than 15 years while 57% of English Toy Terrier breeders claimed fewer than 5 years experience. With this in mind it is not surprising that Toy Manchester breeders produced a higher number of litters on average given that the highest proportion of breeders active during the entire 15 year period are found in this breed/variety. The largest litter produced across all four breeds/varieties during the last 15 years consisted of nine puppies. Two litters of nine were produced, both from Standard Manchester Terrier breedings in the United States and both had six surviving puppies. The largest litter of surviving puppies worldwide was eight. Three litters of eight were born from 2002 - 2015, with all three litters reflecting a survival rate of 100%. Two of the litters were produced by English Toy Terriers in Australia and Finland and the third was from a Manchester Terrier in the United Kingdom. The largest litters of surviving Standard Manchester Terriers and Toy Manchester Terriers both numbered seven puppies. 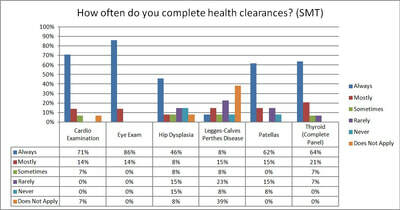 When asked about the size of their most recent litters, 72 breeders provided information on a total of 394 litters. 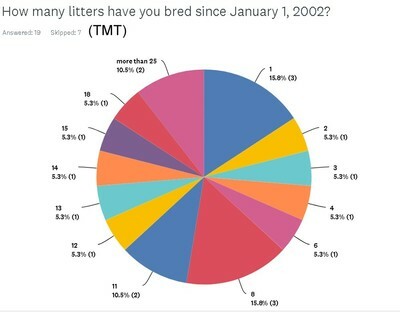 Average litter size across all breeds/varieties was 4.3 puppies, with individual breeds or varietal averages ranging from 3.9 puppies per litter for English Toy Terriers (across 154 litters) to 4.4 for Toy Manchester Terriers (across 132 litters), 4.5 for Manchester Terriers outside North America (across 57 litters) and 5.1 for Standard Manchester Terriers (across 51 litters). Interestingly, a significant geographic difference in litter size was observed in English Toy Terriers, with litter sizes averaging 4.25 puppies among the 83 litters reported by breeders in Europe and Australia versus just 3.4 puppies per litter in the 59 litters reported by breeders in the United Kingdom. 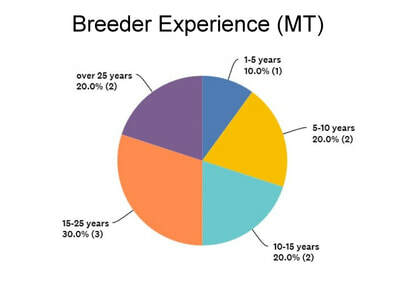 The proportion of breeders with more than 10 years of experience in the breed has almost doubled in the last 15 years, with 47% of breeders in 2002 claiming more than 10 years involvement in the breed compared to 87% in 2017. In 2002, 54 breeders in North America (both varieties) reported producing an average 5.3 litters each in the preceding 12 years. In 2017, 33 breeders in North America produced an average 7.7 litters each over the preceding 15 years. 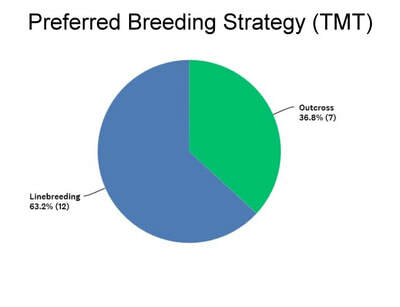 In 2002, 63% of breeders indicated they most often linebreed and 14% of respondents had done an intervariety breeding in the previous 12 years. 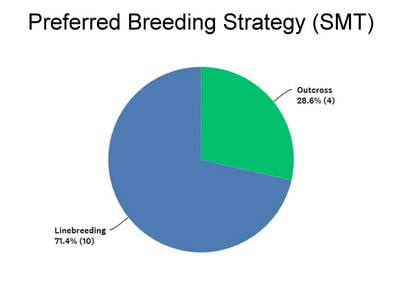 In 2017, 67% of breeders most often linebreed and 15% had done an intervariety breeding in the preceding 15 years. In 2002, 11% of breeders had produced at least one puppy with a cleft palate compared to 12% in 2017. The degree of testing performed by breeders has risen dramatically since the 2002 survey. 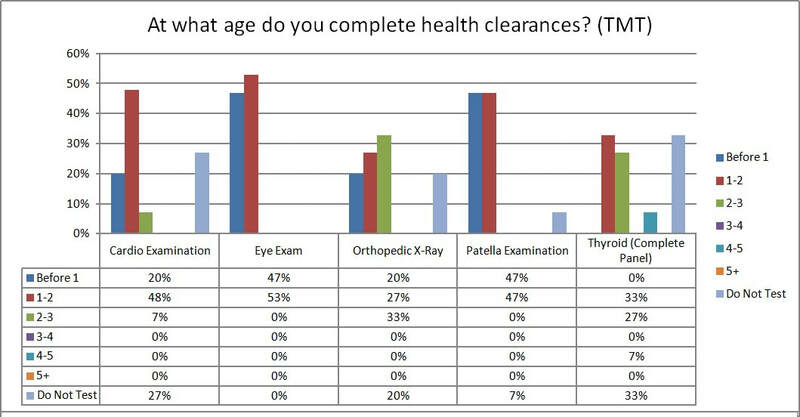 In 2002, 58% of breeders indicated they never CERF tested eyes and just 42% of breeders indicated they always tested for von Willebrand’s Disease. 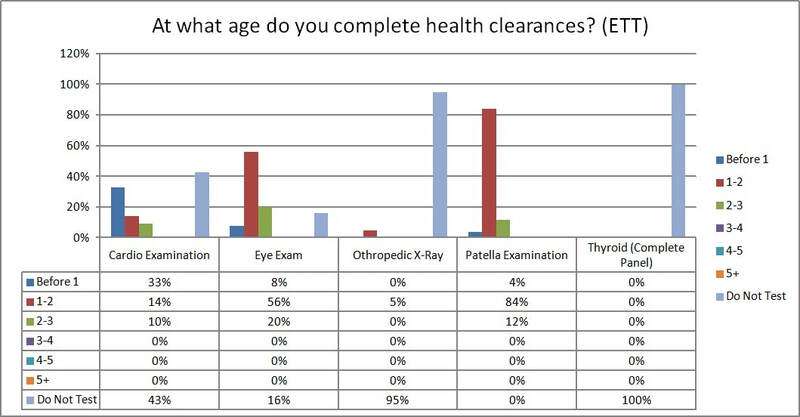 In 2017, 90% of breeders test for von Willebrand’s Disease and 93% do an eye examination ‘always’ or ‘most of the time’. 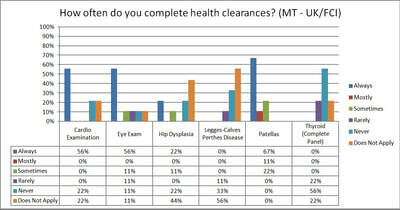 In 2002, respondents felt vWD, cardiomyopathy and Legges-Calves-Perthes were the three most prevalent diseases in the breed. 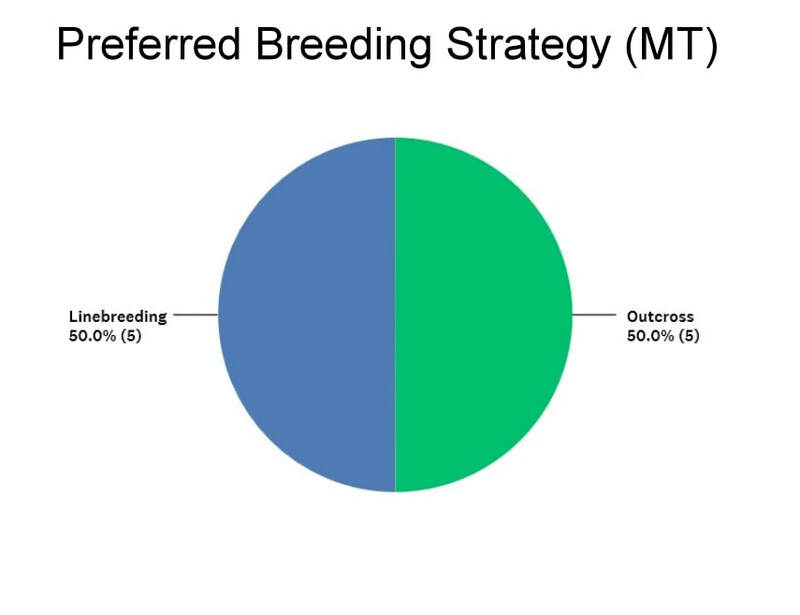 When asked how many breedings were successful versus how many breedings did not result in a litter, 50% of breeders across all four breeds/varieties indicated that all of their breedings had resulted in a litter. This average resulted, however, from a distinct divide between English Toy Terrier and Toy Manchester breeders as over 60% of TMT and ETT breeders reported all litters a success while in Standard Manchester Terriers and Manchester Terriers (UK/FCI) less than 50% of breeders reported all litters a success. 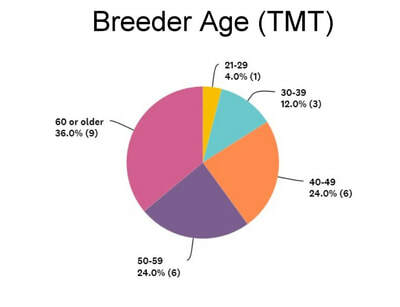 33% of breeders across the entire population reported having at least one litter of puppies delivered by cesarean section with 8% (40) of the 509 litters reported on worldwide requiring sections. The highest proportion of c-sections was seen in Manchester Terriers (UK/FCI) with 10.9% of 55 litters born by c-section followed by English Toy Terriers at 7.7% of 207 litters. Meanwhile, 0 of the 61 Standard Manchester Terrier litters reported required a section. Approximately 9.6% of Toy Manchester Terrier litters required sections, however some variance occurs in this number as two breeders reported three sections among their “more than 25” litters. Because a specific number of litters was not cited, 25 was used for computational purposes, meaning the actual proportion may be slightly lower than indicated. 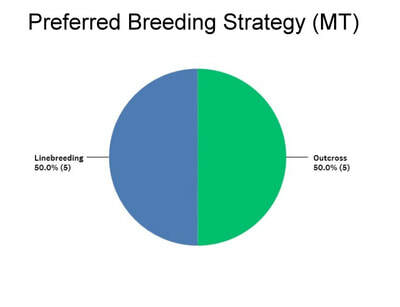 When asked what breeding strategy they use most often, breeders were split across the global population with 35 breeders indicating they linebreed and 35 indicating they outcross. 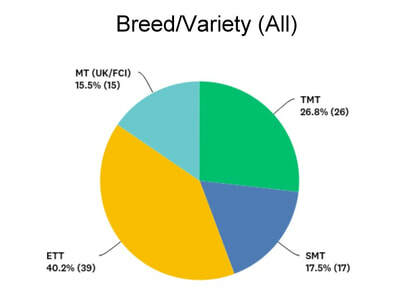 This 50/50 split held true among Manchester Terrier breeders outside North America, while in North America 9 of 13 (69%) Standard Manchester breeders and 12 of 19 (63%) Toy Manchester breeders self-identified as using linebreeding. The opposite was true for English Toy Terrier breeders, with 19 of 28 (68%) breeders indicating they use outcrossing most often. This reversal was heavily influenced by European/Australian breeders with all but one of those 11 breeders indicating they use outcrossing most often. Even so, some 61% (8 of 13) in the United Kingdom also identified outcrossing as the breeding strategy they use most often. In English Toy Terriers and Toy Manchester Terriers, litter averages were roughly equal between breeders who indicated they linebreed versus outcross, however breeders who linebreed in Standard Manchester Terriers averaged almost two more puppies per litter than those employing outcrosses and breeders who linebreed in Manchester Terriers outside North America averaged 0.8 more puppies per litter. Meanwhile, English Toy Terrier breeders who indicated they had imported a dog from another country for breeding purposes averaged 0.8 more puppies per litter than those who did not. Projections of how much impact breeding strategies and/or imports have on litter sizes based on this survey should be viewed with care, however, as the survey questions do not identify litter sizes for imports specifically and breeders were asked to self-identify their breeding strategy of choice without benefit of a common definition or method of evaluation. Additional investigation using objective measurements (i.e., COI, DNA-based diversity measurements, etc.) may be warranted depending on breeder interest. Two of 75 breeders indicated having produced a puppy or puppies of non-standard colouring. The first breeder described producing four puppies with tiny white patches on their chests, the second breeder described a single puppy with ‘grey with tan markings’ that died soon after birth and was found to have no kidneys on necropsy. One of 75 breeders reported producing a puppy with longer hair and an undercoat and noted that coat length changed and undercoat disappeared at approximately one year of age. Two breeders reported producing a puppy with either one or two undescended testicles while four breeders described heart issues (one juvenile dilated cardiomyopathy, one pulmonary artery stenosis, one puppy murmur and one breeder describing “other heart issues”) and four also indicated producing puppies with foot/toe deformities. 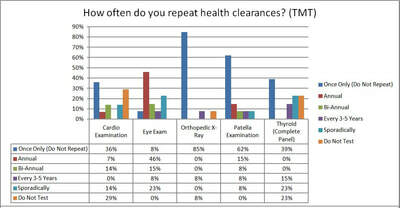 Questions in the health testing section were answered by 62-64 respondents. 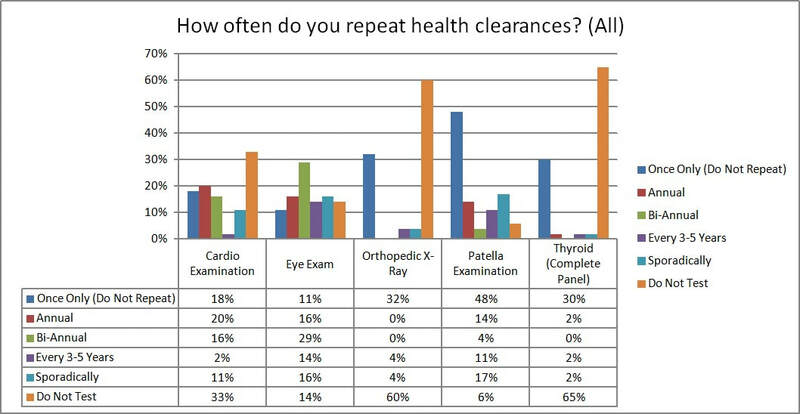 Analyzing testing data on a global level is complicated as each sub-population demonstrated clear differences of opinion regarding health issues facing their community (see Opinion section below). For this reason, data is best viewed individually. 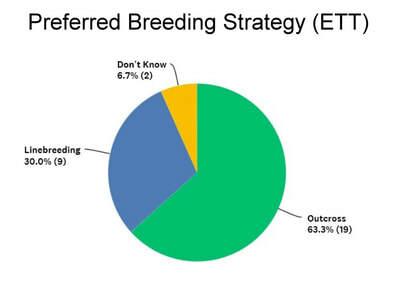 Globally, all 64 of the breeders who answered questions relating to health testing indicated that they engage in clearing breeding stock for at least one issue at least some of the time. 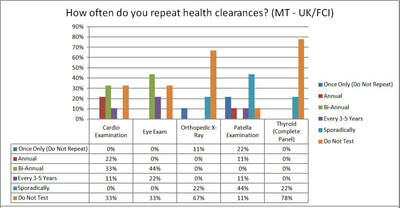 It should be noted, however, that 9 (5 ETT, 3 TMT and one MT-UK/FCI) of the 73 breeders who answered questions on the previous page abandoned their surveys upon reaching questions about health testing practices. 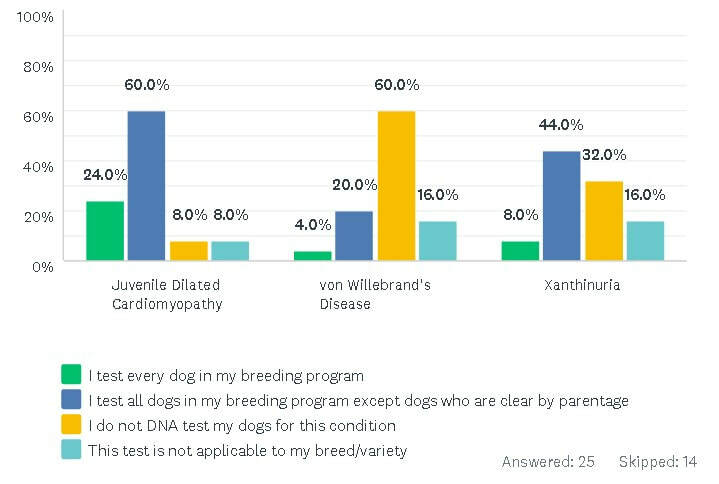 As many as 30-50% of breeders who perform DNA tests indicate they test all dogs in their breeding program rather than simply testing those dogs who are not clear by parentage. 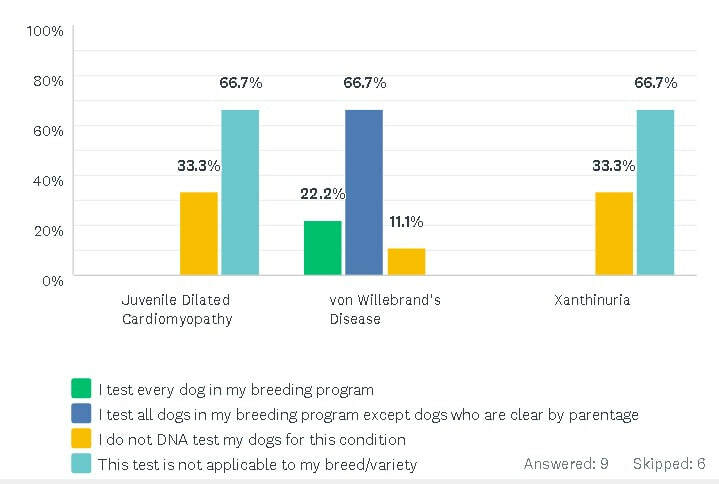 This trend may reflect requirements for testing programs such as the Canine Health Foundation’s CHIC program or the challenge of tracking test results over multiple generations. Breeders in North America, and particularly Standard Manchester Terrier breeders, are most likely to complete testing generally and also most likely to complete a wide number of tests. In ETTs, testing appears to be more targeted with large numbers of breeders completing testing for a small range of diseases (JDCM DNA testing and eye/patella examinations). 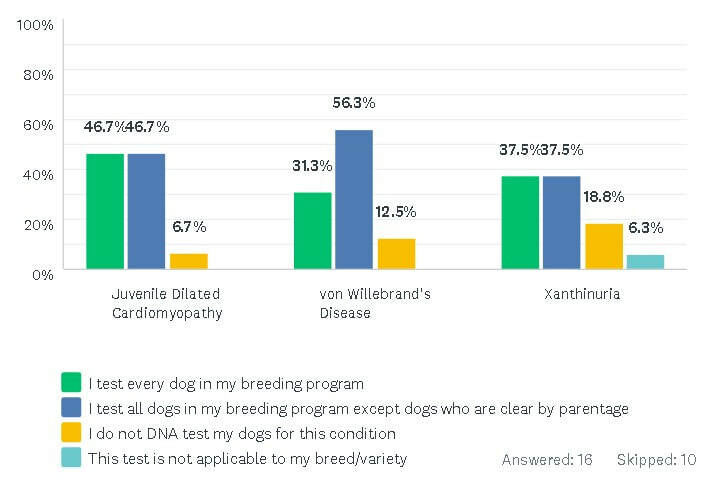 While their sample size was small, Manchester Terrier breeders identify von Willebrand’s Disease DNA testing and patella clearances as most common, though still at low frequencies compared to other breeds/varieties surveyed. 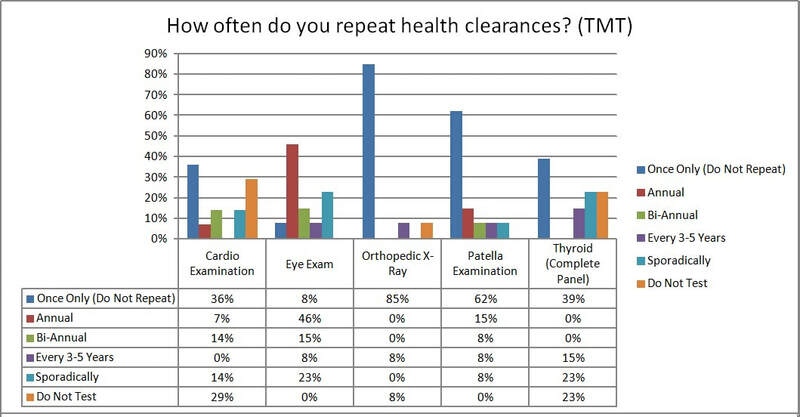 Thyroid testing appears to be performed predominantly in North America only, with zero (0%) of English Toy Terrier and Manchester Terrier breeders outside North America indicating they perform the test beyond extraordinary circumstances. 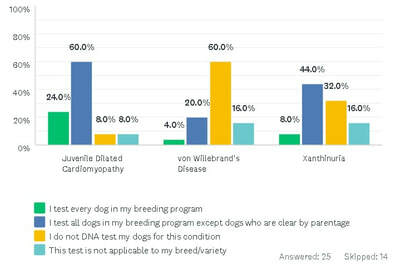 English Toy Terrier breeders are the only group among the larger family of breeders surveyed who do not DNA test for von Willebrand’s Disease with 76% indicating they do not DNA test for the disease. 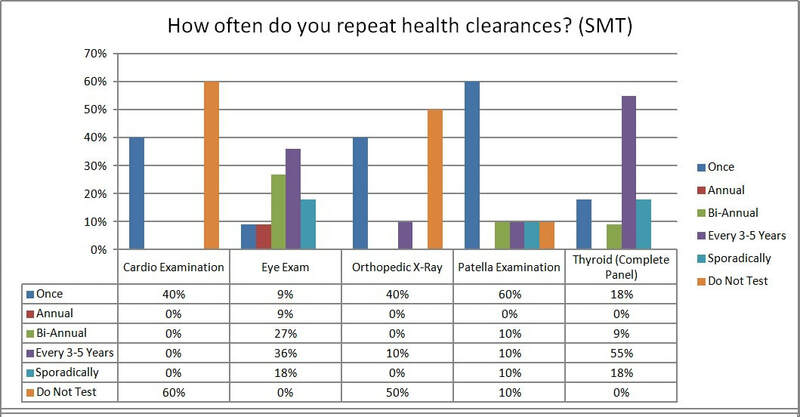 The most universally performed test across the entire population was eye exams, with 100% of English Toy Terrier and Standard Manchester Terrier breeders and 88% of Toy Manchester breeders indicating they ‘always’ or ‘most always’ complete the test. Toy Manchester breeders are more likely to perform initial eye exams and orthopedic x-rays earlier in their dog’s lives. Both Toy and Standard Manchester Terrier breeders were likely to complete patella examinations before a year of age while English Toy Terrier breeders overwhelmingly conduct that test at 1-2 years of age. 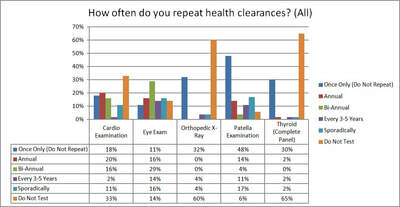 This difference in approach may reflect a difference in tests used for clearances. Further investigation may be warranted depending on breeder interest. 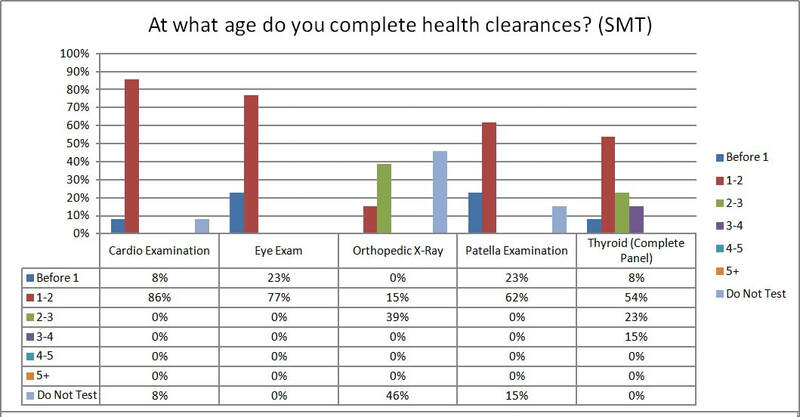 Most breeders conduct patella exams, thyroid panels and orthopedic x-rays one time only while eye exams are most often bi-annual. 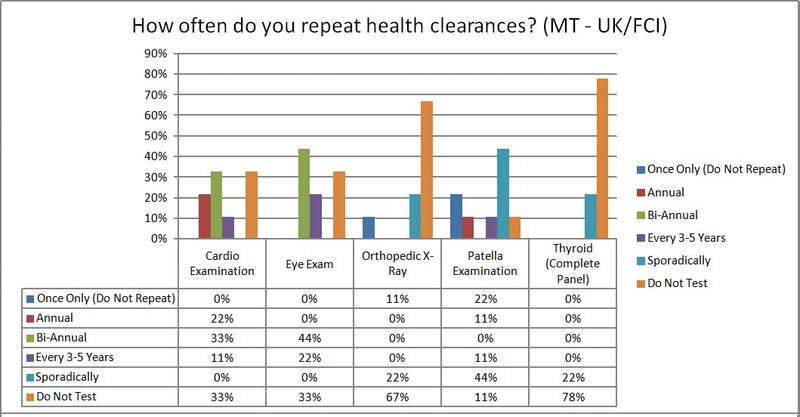 While globally heart testing leans toward annual or bi-annual evaluation, 100% of Standard Manchester Terrier breeders complete heart clearances one time only, which may reflect a difference in understanding of the definition of “cardio examination”. 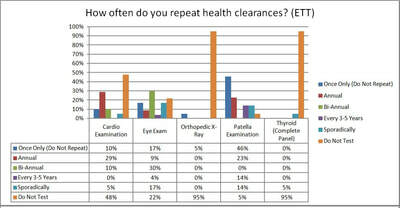 When asked about cardio testing mechanisms, almost all SMT breeders cited methods consistent with formal clearances by a cardiologist where as roughly half of respondents outside North America refer to their own veterinarian listening to the heart with a stethoscope as part of an annual physical. 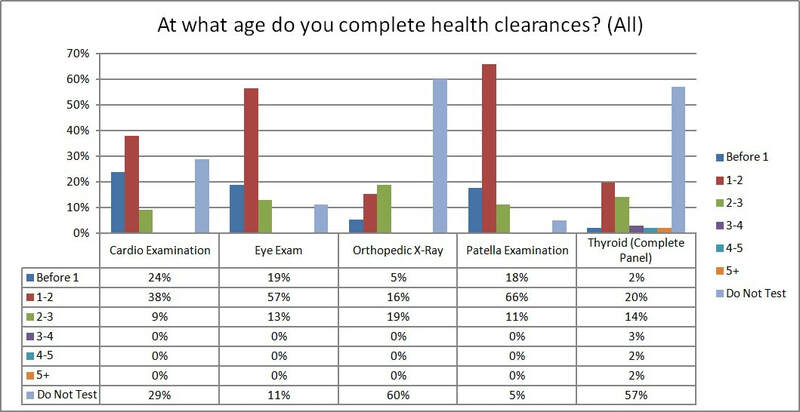 TMT breeders are most likely among the four breeds/varieties to complete clearances for Legges-Calves-Perthes Disease (81%) and Hip Dysplasia (62%). 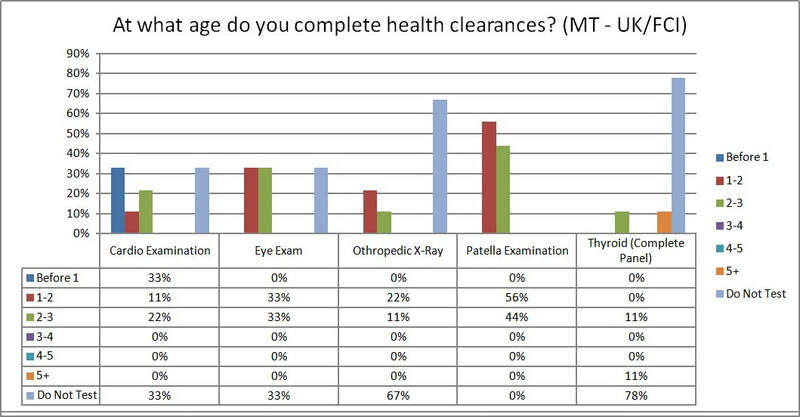 While the data itself doesn’t explain why TMT breeders performed hip dysplasia clearances significantly more often than other breeders surveyed, it should be noted that the same x-ray and submission process is used by the Orthopedic Foundation for Animals to initiate review for both conditions, making it more likely TMT breeders will simply apply for both. 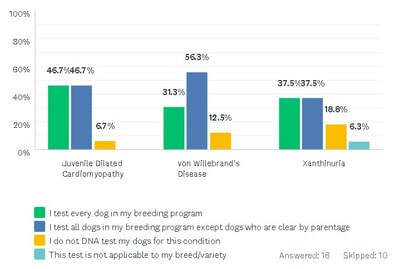 Toy Manchester breeders are also most likely among all breeders surveyed to use DNA tests for Juvenile Dilated Cardiomyopathy and Xanthinuria. 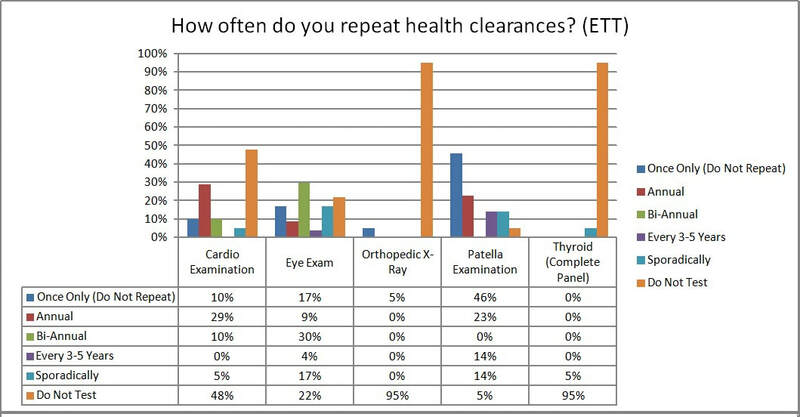 52% of ETT breeders indicate they complete a cardio examination, however 6 of the 9 breeders who complete the clearance indicated their vet listens to the heart with a stethoscope. While this may be a helpful exercise, a distinction should be made between rudimentary exams by local vets who may not be trained to detect complex heart issues as compared to more formal testing by a cardiologist. SMT breeders are most likely among the four breeds/varieties to complete cardio and thyroid clearances. 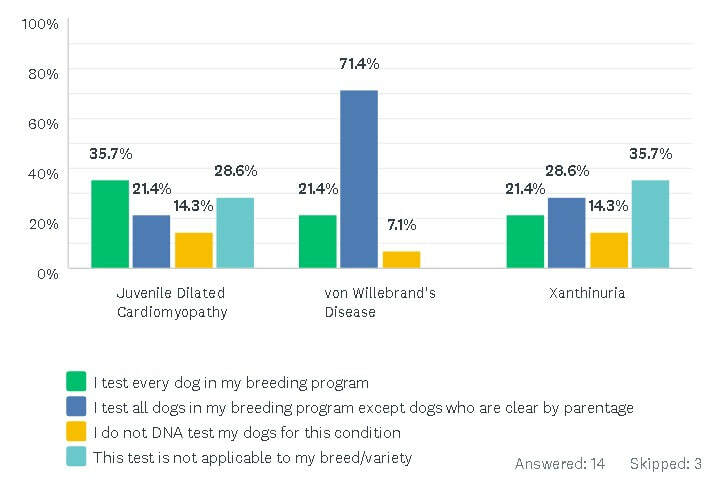 Approximately 50% of Standard Manchester Terrier breeders indicate they DNA test all of their dogs or all dogs that are not clear by parentage for Juvenile Dilated Cardiomyopathy (JDCM) and Xanthinuria. This is an interesting finding given no Standard Manchesters have been identified as carrying the gene to-date. 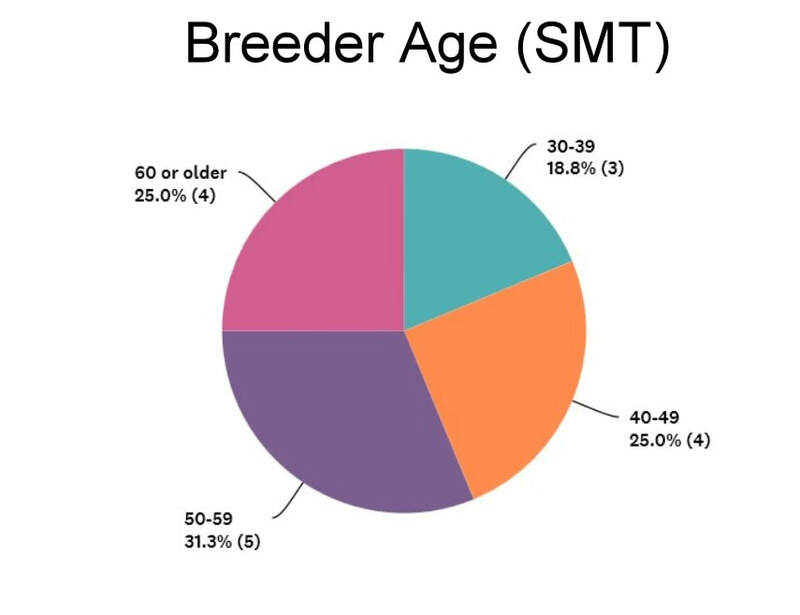 It is unclear, however, if respondents were indicating an ongoing commitment to testing for these diseases or if the responses reflect the wide participation of breeders in the Canadian Manchester Terrier Club's project to test a sample of SMTs for the diseases. Data for Manchester Terrier breeders outside North America should be viewed with care as just nine breeders responded to questions about testing, meaning results cannot be seen as representative. Questions in the opinion section were answered by 49-62 respondents. Interestingly, genetic tests exist for two of the issues listed (von Willebrand’s Disease and Juvenile Dilated Cardiomyopathy). Additional attention is warranted to determine the nature of breeder concern with regard to conditions for which definitive tests are available as well as to determine the specific nature of general umbrella terms used such as heart or eye “issues”.